Have chimneys inspected regularly by a registered chimney engineer to ensure the liner and brickwork is good. A thatcher should check the hidden section when re-thatching. 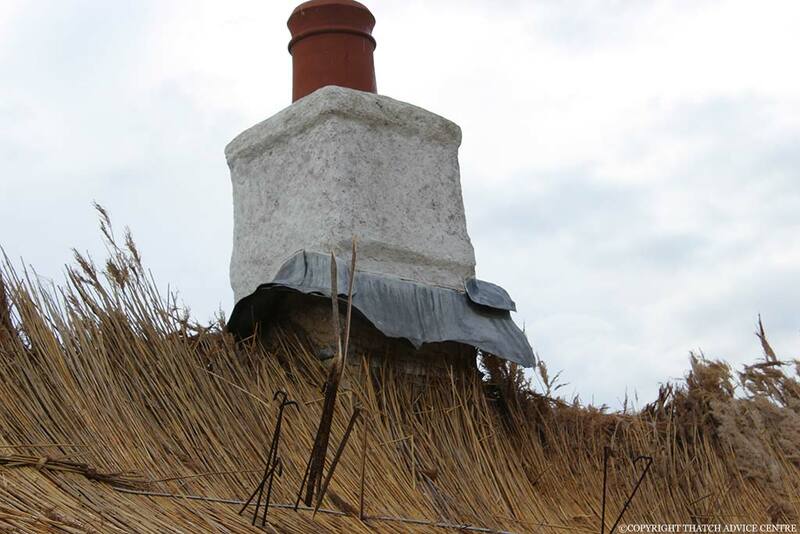 Ensure the top of the chimney pots are at least 1.8 metres above the thatch. The height requirement is thought to allow for any sparks/embers to preferably die out before they exit the chimney or be ejected away from the thatch. The reason for 1.8m is a topic for discussion as although it is in building regulations no one knows exactly why that height– best guess has been that it is the height of a person. This topic was discussed at length by experts at a Thatch Fire Safety Seminar in Suffolk but no definitive answer was given. The chimney should be swept twice a year or quarterly if wood is burnt. Chemical flue cleaners are available to help remove and loosen tar deposits but care must be taken. They can be used before a chimney is swept to aid the cleaning. Spark arrestors are not recommended. This is because they can become clogged (either naturally or through lack of maintenance) restricting free flow of combustion gases and also becoming a fire hazard in themselves. If you cannot keep one very clean and clear then it will not work as it should and is more of a fire hazard. Appropriate liners to meet the regulations are required depending on the fire below your chimney. Professional advice should always be sought. Register plates – are non combustible horizontal plates fitted to close off large flues and allow a much smaller flue pipe to exhaust into them. Care must be taken and professional advice sought with the use of this method. Concern over heat transfer from chimney bricks to thatch was always thought to be a major cause of thatch fires. Thatchers and homeowners now understand better that this theory, although good in its time, was only a theory. Practically thatch burns at just under 200 degrees. The chimney would have to be very hot for a length of time for the bricks to get these hot spots and set the thatch on fire. The Burgoynes Forensic Investigation of Thatch Fires further confirmed the heat transfer theory to be less likely. More likely, chimney fires ejecting sparks which drop down onto the thatch or possibly a spark going through gaps in old mortar between the bricks. Their update for 2012-2013 heating season further raised questions. Care of the chimney and what is burnt is therefore paramount. Whatever the cause vigilance and common sense are important factors in reducing the risk that chimneys from woodburners and open fires present to thatched roofs. Please understand thatched homes have had fires for hundreds of years, Woodburners are more a recent introduction and burn hotter, so with more risk but understanding this and making informed choices on your individual property are the way forward. Developments in woodburner safety are also improving the situation. Investigation into woodburners, fires, liners and flues with respect to thatched properties is underway and we will keep you updated.